At a breakfast meeting today in Washington, D.C., Chris Chocola, President of the influential conservative non-profit Club for Growth named South Carolina Sen. Lindsey Graham as a top target for the group in 2014 elections. "The goal of tax policy should be to raise the amount of money needed to fund legitimate functions of government while doing the least amount of damage to the economy and respecting the principle of treating taxpayers equally." “Senator Graham agrees with the Club for Growth on most issues, but we do have some sharp differences, particularly on Chinese currency manipulation and Ex-Im Bank. “For years, the Club for Growth has absolutely detested Lindsey Graham’s relentless drive to hold China accountable for its currency manipulation. At one time, the Club for Growth even had a note on their congressional ratings page warning members not to sign onto Senator Graham’s Chinese currency manipulation bill. “The Club for Growth also opposed his outspoken support for reauthorization of Ex-Im Bank, even though it is an incredibly important issue to thousands of South Carolina workers who produce Boeing's 787 Dreamliner in North Charleston. Eighty percent of the 787's produced in South Carolina will be sold to companies who are eligible for and routinely use Ex-Im financing. 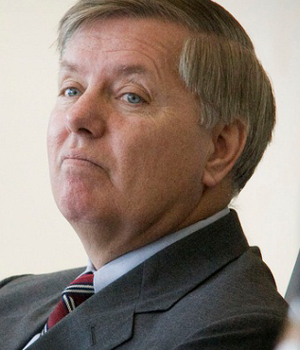 “Senator Graham would love to have a world without Ex-Im Banks, but that world doesn’t exist. He sees no evidence that competitor nations like China are getting out of the Ex-Im business, and he doesn’t believe the United States should unilaterally disarm. “Senator Graham is currently focused on the massive fiscal problems facing our nation and ensuring the United States remains a strong national security voice in a deteriorating world. He continues to work with the Romney campaign to unseat President Obama, and he's campaigning hard to win a GOP majority in the Senate. Chocola's comments today gave voice to the commonly held sentiment that Graham will be challenged from his right in the primary. The Club for Growth, in conjunction with the DeMint-led Senate Congressional Fund, has been successful in unseating sitting senators they deemed not conservative enough, most notably knocking off Richard Lugar of Indiana this year.